While this works nicely, it has the disadvantage of requiring another wire. Can we do it without introducing any additional connections? I accidentally stumbled upon another way: When the WS2812 LEDS are set to the brightest level of white (255,255,255) they draw around 60 mA of current. This leads to a measurable voltage drop on the power rails. So we can get a good idea of the number of LEDs connected to a power source by setting it to a known pattern and measuring the resulting voltage drop. Many microcontrollers actually allow using their internal ADC to measure the supply voltage. If the MCU is connected to the same power supply as the LED string, it can determine the current draw of the WS2812 LEDs without any additional hardware. I tried this on an ATtiny841. The code below uses the internal ADC to measure the band gap voltage (1.1 V) using VCC as reference. From this, it is possible to calculate the actual supply voltage. It is necessary to average a number of measurements due to noise introduced into the power rail by the WS2812 pulse width modulation. Measures the supply voltage internally using the ADC. The image below shows the output for a WS2812 string after converting the ADC output to a voltage. Both the LED string and the microcontroller were connected to a USB port as power supply. It is easily noticeable that there are only 16 LEDs in the string as no further drop of the supply voltage occurs after this point. Interestingly, this information can also be used to calculate the effective internal impedance of the power supply. In this example it is 0.5 Ohm, assuming that every LED draws 60 mA. The main contributor to the series resistance is probably a poly fuse that is used to protect the USB port power rails. 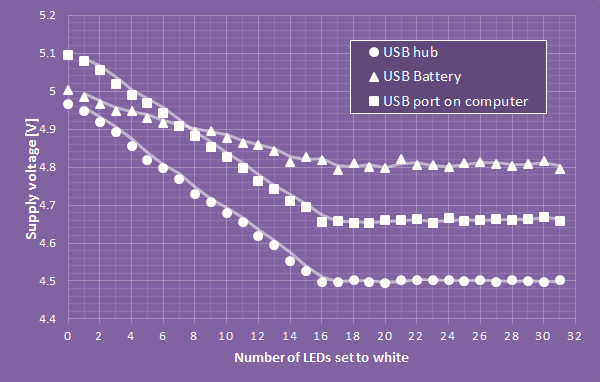 The image above compares the behavior of several USB power sources. The USB battery has the lowest internal resistance, as indicated by the flat slope. In this case it becomes more difficult to resolve the contribution of individual LEDs and it is only possible to get an estimate of the string lengths. In conclusion, even though it is a bit hacky, measuring the supply voltage allows to get a good estimate of the length of a WS2812 string without any additional connections. Nice write up. This effort is an excellent example of thinking about using additional information that you can gather about your circuit. Perhaps you can apply a little more math and make the test slower but more robust with the battery. I suggest toggling the first LED 5 (tweak to optimize) times and getting an average voltage delta for the on vs off state. Use a fraction of this delta as your test to determine if there if the next LED is present (we only want to know is there an actual delta that correlates with the next LED’s on state). The turn the first LED off and toggle the 2nd LED 5 times. If there was a 2nd LED, uses a fraction of that voltage delta as your test value for your next LED. Obviously there should be no delta for an address with no LED. In essence we want to change from an analog mapping measurement into a digital comparison test with a shifting window level for the comparison. Please let me know if you get a chance to try it. Great blog. thank your for your comment. Yes you are right, there are several ways to make this more efficient. By integrating more measurements it would be possible to get a higher resolution. I agree that just using a single LED to “probe” could be more efficient, especially if there as a danger of overloading the power source. One could use the first LED to get the voltage delta, as you described, and then use a binary search pattern to speed up the process. Indentation is off in the second code snippet. of course, this is a little bit slower than your method. This (or one of the single-led-at-a-time variants) should be fairly reliable for short strings powered by a relatively high effective resistance power supply. It may be harder for a series of 150 or 300 LEDs. First off, they are going to require a much lower impedance power supply, and secondly the delta current (one lit LED plus N dark currents, vs no lit LEDs plus N dark currents) is going to get less dramatic (lower S/N). (and its worse still if you light the first K pixels rather than just one). 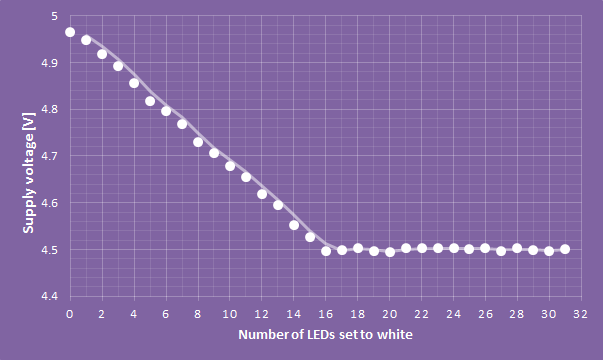 One could partially counter the latter effect by lighting M LEDs at a time rather than just 1, albeit one would get a less precise count that way (eg: lighting pixels 95-100 drops the voltage vs non lit, but lighting pixels 101-105 does not – so there are around 100 pixels). Still, it’s clever and and quite useful in some circumstances, thanks for the tip. Another thought – if one wanted, one could have a series resistor between the power supply and the load, which could be switched in or out of the circuit – eg: using a relay to short across it when operating normally (ie: many LEDs lit at once which would drop too much across the resistor)..
Rather than measuring the uC’s own power, one could use a resistive voltage divider (after the series resistor in the power line) to bring the measured voltage down to less than 1.1v and do the ADC against the 1.1v reference. This would allow finding the last pixel of even longer strings, and could work when the uC is using a separate supply or using onboard regulation from a higher Vin, and when the LEDs are running at 12v, etc – at the cost of 3 resistors and a relay. Again, that’s a slightly different niche than your no-external-components approach. Like a control box into which different strings might be plugged. And if you wanted to be fancier than that, you could use a current sensor chip for more accuracy (and no need for a relay). I am a couple of years late here… But… Can you help me decode the below technique you mentioned? Would I wire in the DO pin of the last LED into a digital input on the arduino? What am I reading here? >An intuitive approach to counting the number of LEDs is to feed the output of the last LED of the string back into the microcontroller. According to the WS2812 protocol, the output of LED number n is low until data for n+1 LEDs has been pushed to the string. To count the number of LEDs, data is fed to the string until a rising transition is detected on the output. A relatively easy way to implement this is by using a pin change interrupt on the AVR, or a similar feature on other microcontrollers.